Climate impacts have historically had devastating consequences for Caribbean nations, putting considerable strain on the finances of governments, businesses and citizens. Not only do weather and climate-related events dominate natural hazard occurrence in the Caribbean, these events are associated with more economic damage and loss cumulatively than other types of natural hazards. Projections suggest that weather and climate events are likely to continue to incur losses, presenting a compelling case for action. This is especially so in sectors that remain highly sensitive to climate – particularly the Agriculture and Food Security, Water, Disaster Risk Management, Health, Tourism and Energy sectors. Climate early warning information that is tailored to the needs of these sectors can be of great value because it can help practitioners to anticipate and respond to climate-related risks and opportunities. Since 2015, the Caribbean Institute for Meteorology and Hydrology (CIMH) in collaboration with its network of National Meteorological and Hydrological Services (NMHSs) and its Consortium of Sectoral Early Warning Information Systems Across Climate Timescales (EWISACTs) Coordination partners have been working together to increase the range of sector-specific climate products, as well as integrated decision-support processes and tools that support evidence-based and risk informed decisions in key sectors in the Caribbean. 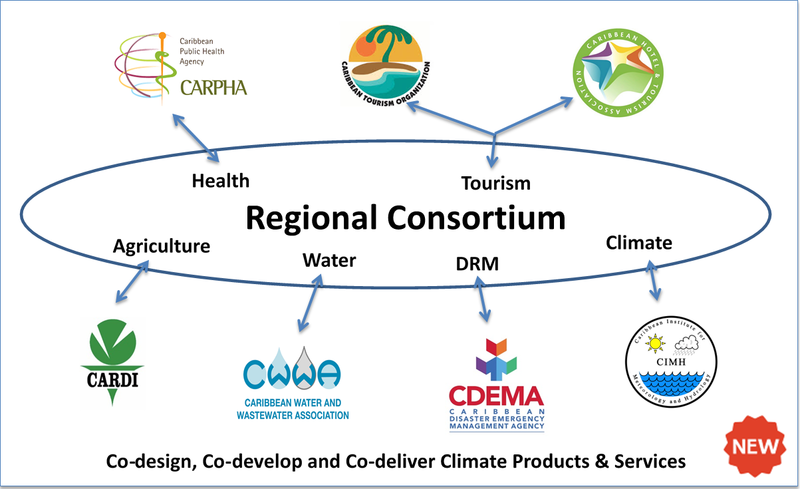 The Consortium is an alliance of sector agencies and the CIMH – each committed to partnering on the development and integration of climate services in sectoral decision-making. As a regional climate service governance mechanism, the Consortium leverages the position and expertise of lead technical organisations such as the Caribbean Agricultural Research & Development Institute (CARDI), the Caribbean Water and Wastewater Association (CWWA), the Caribbean Disaster Emergency Management Agency (CDEMA), the Caribbean Public Health Agency (CARPHA), the Caribbean Tourism Organization (CTO) and the Caribbean Hotel and Tourism Association (CHTA). To date, this multi-institutional alliance has produced sector-specific climate Bulletins which synthesise key climate messages from CIMH’s existing suite of technical climate products and communicate sectoral risks and opportunities associated with these conditions for up to 3 to 6 months in advance. The CIMH and its Consortium partners have already begun to develop the next generation of sector-specific products. One priority application is in the fight against Aedes aegypti borne diseases such as Yellow fever, Dengue fever, Chikungunya and Zika which have historically placed a serious health burden on Caribbean societies. Here, the CIMH is partnering with the CARPHA, the Pan American Health Organization, national Ministries of Health, national Met Services and international research teams to co-design and co-develop a climate-driven spatio-temporal modelling framework that provides early warning of the increased risk of Aedes aegypti diseases. Over time, the outputs of this modelling framework can be used for operational, evidence-based decision making in the area of vector surveillance and control. The CIMH is also partnering with the CTO and the CHTA to develop a tourism-climate spatio-temporal modelling framework that predicts the influence of intra- and extra- regional climate on tourist arrivals to the Caribbean. Over time, the outputs of this modelling framework can be used to inform strategic and operational marketing decisions – helping the region to take advantage of revenue opportunities that can arise from unfavourable climate conditions in tourist-generating regions or alternatively to manage risks associated with an adverse climate forecast such as severe drought conditions in the Caribbean.